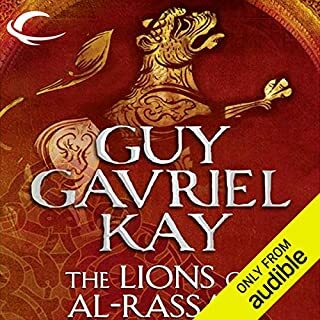 Would you consider the audio edition of The Lions of Al-Rassan to be better than the print version? I'd say yes, but unfortunately a lot of the names of people and places in this book are phonetically similar to the point of confusion. Only towards the end of the full recording did I begin to finally separate the characters and places in my head. The pacing was also slightly hurried in parts that could use more attention. The reading was fantastic, but after hearing Simon Vance's reading of Tigana, it's hard not to keep such a standard in mind for comparison. What was one of the most memorable moments of The Lions of Al-Rassan? The part of the Echoing Valley. That's all I'll say to not give more away. Which character – as performed by Euan Morton – was your favorite? It is most definitely a tie between Rodrigo Belmonte and Ammar ibn Khairan. Rodrigo's character was simple on the surface, but his development and the care Euan Morton gave in the reading complimented him well. Where the performer shined was in his portrayal of Ammar. It was sheer poetry in the strictest sense. I can't say enough about these two characters. They both hold a solid place in my heart. The Circling Paths of Love and War, As traced Across Both Time and The Heavens. Maybe the people written about in this novel lived in an extraordinary time. I say that because everyone seemed so amazing and so complicated in motivation. At times though, I found myself suspending my disbelief just to go with the momentum of the book. I suppose I'd say that the story is more poetic than realistic. I feel this book would help bridge huge chasms in understanding between different religions and cultures, even those considered extremist and violent. All the cultures portrayed proved to be violent and fearful in their own ways, but then again they all had strong moral and artistic values they held in high esteem just as we all do today. It makes me feel as though my personal belief system could be small-minded, but still valid in it's own right. There are a lot of authors whose work I read or listen too, but part of me feels like I can truly identify with Guy Gavriel Kay; like we're brothers of a sort, even if we may be from different walks of life. Sometimes his work is a stretch for me, but there's such a poetic depth to it that any small qualms I have can easily be overlooked. I also feel no medium other than printed page or spoken word could do his work justice. Even with the largest budget, putting faces to these (at times) mythical characters would rob them of the power and vitality they hold in in print and in voice. In short, I recommend this story, but not as much as I recommend _all_ of Mr. Kay's stories. I couldn't wait to get back here to purchase another book. Thanks for reading this far, and I hope that you'll enjoy The Lions of Al-Rassan as much and as truly as I did. If you could sum up The Alloy of Law in three words, what would they be? What I liked best about this story were the interactions between the protagonist and secondary characters. It felt like I was listening to an old western radio serial. There were so many simple motivations for each character, and yet each person was as complicated and textured as they come. Which character – as performed by Michael Kramer – was your favorite? Wayne was my favorite. He ties with another, but I don't want to give anything away. 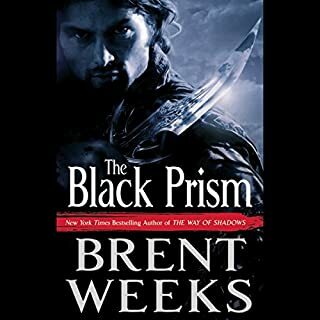 Michael Kramer's range and polish as a reader are insurmountable as always, but I really feel like all of Brandon Sanderson's authorial tools and tricks were put to good use in this book. Sanderson ended up weaving a jewel of tale, just waiting to be extracted from the wreckage of it's predecessors. When I say "wreckage", I don't mean bad writing. Moreso I mean the state of mind the Mistborn trilogy left me in. As the title of this review hints, the trilogy broke my heart. Everything about it; the ending, the plot points leading up to the end and the tragedy that deeply marred that series' universe throughout the telling left me feeling like I'd almost been taken advantage of. I enjoyed the protagonist, the support cast, and the villains, as well as the multifaceted motivations of each, but I couldn't help feeling that Sanderson was going after a certain idealism, and he used his characters as fodder for that ideal–fodder in the most literal sense. It always seemed like tragedy was looming around each corner, and more than likely, it was. The series was immersive if not excruciating, to say the least. The Alloy of Law is just as immersive, but it has a more prosperous feel–like turn of the century westerns. There seem to be slight enhancements made to the systems and rules of the Mistborn universe in this story. But where as those books felt like dreaded dirges with occasional bright spots, This book reads like a box office smash of an action movie. It is robust and I feel it's a story both young and old readers will enjoy. 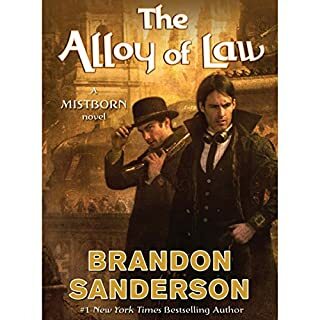 But to make the surreal, over-the-top and humorous things that happen within this story palatable and believable, it's a good idea to read the Mistborn Trilogy. I honestly can't wait for the next installment of this series and I hope you'll all enjoy it as much as I did. I was listening to this in the car and I almost wanted to go on a 10 hour road trip to finish it up. I honestly don't know where they found this reader. i mean he's got a lisp and he sounds like a first year drama student. the reader for the way of shadows was above and beyond so i got spoiled by it. Really frustrating but i'll have to keep listening to get my credit's worth. the writing, however, is just as enthralling as the other books Mr. Weeks wrote.